Identifies oil deposits predating the Pennsylvania Oil Rush by more than 30 years. Map of Pennsylvania and New Jersey by H. S. Tanner. A rare and important map of Pennsylvania and New Jersey by H. S. Tanner. 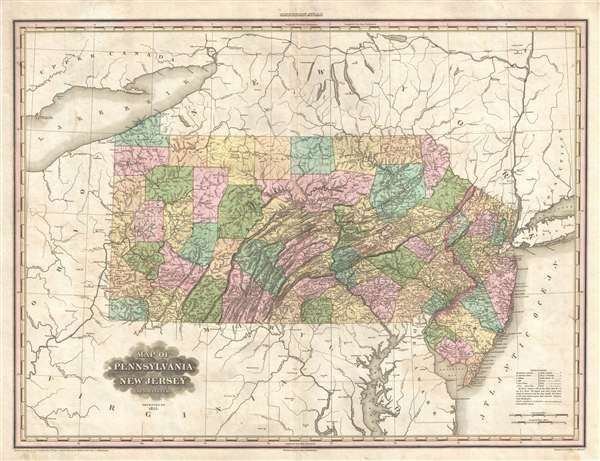 This elephant folio map covers all of Pennsylvania and New Jersey as well as, in less detail, adjacent parts of New York, Ohio, Virginia, an Maryland. The map shows rivers, topography by hachure, cities, towns and roadways. The map also notes various industrial sites, such as saw mills and glasswords, salt and iron mines, and even what appears to be an oil company in Clearfield County (predating Pennsylvania Oil boom by more than 30 years). Tanner first published this map in 1823. The present example is the scarce 2nd edition from 1825. This map was published in the 1825 edition of Tanner's iconic New American Atlas. This map, like all maps from the New American Atlas, is today rarely seen on the market. Very good. Minor wear and toning on original centerfold. Verso reinforcement along centerfold. Some offsetting. Rumsey 2755.010. Phillips (Atlases) 3669-10.